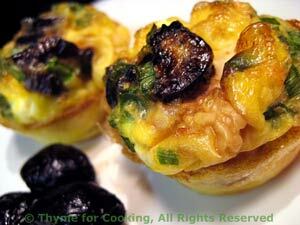 Feta and Greek Olive Mini Frittatas, Thyme for Cooking easy first course. These are delicious warm or cold, right from the fridge. If you choose not to have them all for a first course, refrigerate them for breakfast tomorrow. I often make a double batch to just to have on hand. They'll keep for several days in the fridge. Oil or spray a nonstick muffin (tartlet) pan - one that holds 6, or use a silicone pan (which should not need any oil). Cut or crumble feta, divide evenly and place in muffin cups. Cut olives in half and place on feta. Snip herbs and divide between cups. Frittatas will puff up considerably and then fall when removed from oven. Allow to cool 5 - 10 minutes before removing from pan - they will start to come away from the sides of the pan as they fall making them easier to get out. Serve, garnished with a few more olives, warm or at room temperature.